Nearly 33 years after his plane was shot down over in coastal waters off North Vietnam, Navy Lieutenant Commander Roger B. Innes was buried on home soil Friday. Innes was buried at Arlington National Cemetery in Virginia as National POW/MIA Recognition Day was marked with ceremonies across the country. Thousands of miles away, Innes story was told at Hickam Air Force Base in Hawaii, home to the Army lab that identified the remains of the long-missing radar operator. The story is one about "the power of hope and determination," said Brigadier General Harry Axson Jr., commanding general of Joint Task Force/Full Accounting. A Vietnamese fisherman found part of Innes' plane in 1995. His remains were recovered in 1998 and taken to Hickam where the Chicago native was identified last year. "Many other families of U.S. servicemen are still waiting for answers," Axson said. "Today, perhaps like no other time in the history of American wars, has such an organized effort ... been mounted to resolve the fate of U.S. service members." Axson read from a letter he received from Innes' sister, Gail Innes, in which she said "today's science and technology have made it possible for me and my family to at last have our answer. There are answers out there, sometimes in as little as 30 feet of water." The pilot of the aircraft was Captain Leonard Murray Lee. They were airborne over southeast Asia during the height of the Vietnam War. Navy Lieutenant Commander Roger Innes of Chicago vanished in Vietnam in 1967. Marine Master Sergeant Timothy Bodden of Downer's Grove also vanished in 1967. ABC7's I-team has learned that U.S. military officials have now solved the mystery of what happened to those two airmen from Illinois. After 30 years, the remains of Commander Innes have been found in Vietnam and identified. The wreckage of master Sergeant Bodden's helicopter has been recovered in Laos. The developments ease more than 30 years of frustration for family members. The ABC7 I-Team has learned that both Illinois airmen have been positively identified and that the Deputy U.S. Defense Secretary was scheduled to make an announcement Friday morning during a POW/MIA memorial ceremony at the Pentagon. What the I-Team can show you is the story of how all this came about -- a story that spans five decades. Two days after Christmas, 1967, U.S. fighter aircraft lift off for a mission over North Vietnam. The radarman aboard one F-4B Phantom jet is Navy. 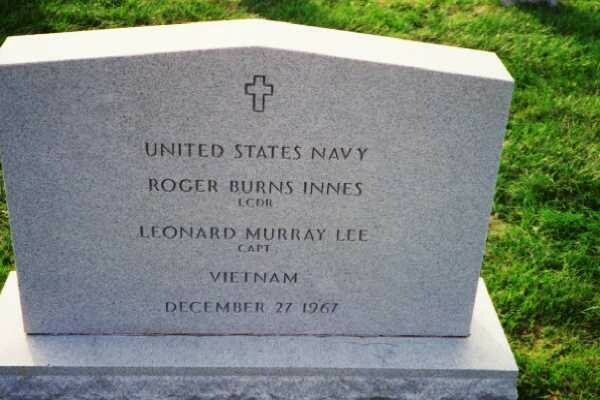 Lieutenant Commander Roger Burns Innes from Chicago. Innes' plane never made it back to the carrier Kitty Hawk. He and the pilot were listed as missing in action and after the war designated as presumed dead. Innes' sister Gail and the National League of POW/MIA Families have spent years pressuring the military to search for 2,000 missing soldiers. In 1992 teams of U.S. investigators began searching Vietnam for the missing soldiers, and collecting clues from local fisherman, that eventually led them to Innes' remains. "They said they had interviewed villagers who said 'We keep catching our nets on something' and they went back and found that it could be the site where my brother crashed," said Gail Innes. One villager interviewed by U.S. investigators claimed to have shot down a low-flying plane with a rifle in 1967 at a spot where excavation teams arrived to search for Innes' remains. Divers quickly located wreckage from the jet. They pulled up plane parts and the crew's personal possessions. And they found skeletal remains. DNA tests on bone fragments matched the DNA provided by Gail Innes. According to an Army case file obtained by the I-Team, the remains were Roger Innes. "I am so relieved because I know now he wasn't tortured and that he died on impact," said Gail. "I never thought in my wildest dreams that I'd ever get an answer...it's a miracle." On Friday morning, Gail Innes, relatives and friends gathered at Arlington National Cemetery where Roger will be buried with full military honors almost 33 years after he died. In his casket will be a POW/MIA bracelet that his sister wore for many years. "I wanted him back in his own country. I wanted him home, is what I wanted," said Gail. The road home comes up short for the other airman, Master Sergeant Timothy Bodden. Bodden grew up in west suburban Downer's Grove. His family now lives south of Decatur. "About 30 days ago, the Marines made a visit to our home here," said Richard Bodden, Timothy's brother. What they told Bodden's brother and mother was that his helicopter wreckage had been recovered in Laos where it crashed on June 3, 1967. The remains of three crewmen were identified by DNA tests. There was no DNA match for Bodden, but the military has concluded Bodden died in the crash. "It's just a sense of relief. It's just a reality that's all there is," said Richard Bodden. "I know this is as much as I'm ever going to know," said Dorothy Semraw, Sgt. Bodden's mother. "We do know Tim was killed from the reports of men in the helicopter and ones who got away. We know he was hit from the bottom as he rose. Hit once, fell down, got up and fell and never got up again." American military officials at the Pentagon are expected to announce next week what we've just told you, the identification of Master Sergeant Tim Bodden and the others who died in that Indochina helicopter crash more than 30 years ago. Those men received a military funeral at Arlington in late November. But that wasn't the end of it. There are 81 other Illinois soldiers still unaccounted from the Vietnam War -- soldiers whose families are still waiting. DES PERE, Missouri - Navy Lieutenant Commander Roger B. Innes will be buried today, nearly 33 years after his F-4 Phantom II fighter was shot down during the Vietnam War. Innes will be buried in Arlington National Cemetery in Washington, D.C., with his widow and family looking on. Innes was a back-seat radar operator in the fighter that was shot down over North Vietnam and crashed in a bay on December 27, 1967. He died 16 months after marrying Sandy Davis, who now lives in the St. Louis suburb of Des Peres. Navy divers located and removed the fighter's remains in June 1999. They were sent to Hawaii to an Army lab for the lengthy process of DNA testing. Last month, the remains were positively identified as those of Innes, a native of Chicago. He was 24 when he died. Davis, 54, grew up in Granite City, Illinois, as Sandy Noeph. She went on to Culver-Stockton College in Canton, Missouri. There, she met Innes, a fellow student. He graduated in 1965; she dropped out of school to marry him the following year, on Aug. 20, 1966. Innes left for a deployment to Vietnam aboard the carrier Kitty Hawk in November 1967. A month later, he was dead. ''It didn't take long, did it?'' Davis said. After the aviator was killed, Davis worked for a time in a bank in Granite City. Then she returned to college, to Southern Illinois University in Edwardsville, Illinois, and got a degree in education. She taught for three years in Edwardsville. She also helped to found a group called Families of MIAs and POWs in Southeast Asia. In 1977, after the finding of presumptive death, she married Robert Davis. ''And then I started having my own children,'' she said, ''so I had to give up teaching. These days, all I teach is religion classes,'' at St. Gerald Majella Roman Catholic Church in Kirkwood, Missouri. Her husband and sons will accompany her to Washington for the burial of her first husband. Also on hand from across the country will be his family -- including his sister, Gail Innes of Chicago, who has kept in touch with Davis across the years. ''Until a couple of days ago, his sister and I would have called the news a celebration,'' Davis said. ''That's because we knew at last that he had been killed in the plane and hadn't been captured and suffered as a prisoner of war. On Friday at Arlington National Cemetery, Sandy Davis of Des Peres will bury the husband she lost almost a third of a century ago. The burial is for Navy Lieutenant Commander Roger B. Innes, a native of Chicago. The F-4 Phantom II fighter in which he was a back-seat radar operator was shot down over North Vietnam and crashed in a bay on December 27, 1967 - just 16 months after he married Davis. In June last year, Navy divers located and removed the fighter's remains. They were sent to Hawaii to an Army lab for the lengthy process of DNA testing. Last month, the remains were positively identified as those of Innes. He was 24 when he died. Davis, 54, grew up in Granite City as Sandy Noeph. She went on to Culver-Stockton College in Canton, Mo. There, she met Innes, a fellow student. He graduated in 1965; she dropped out of school to marry him the following year, on Aug. 20, 1966. Innes left for a deployment to Vietnam aboard the carrier Kitty Hawk in November 1967. A month later, he was dead. "It didn't take long, did it?" Davis mused. Still, with no remains in hand, the government waited until 1977 to issue what it calls a "finding of presumptive death." After the aviator was killed, Davis worked for a time in a bank in Granite City. Then she returned to college, to Southern Illinois University in Edwardsville, and got a degree in education. She taught for three years in Edwardsville. She also helped to found - and played an active part in - a group called Families of MIAs and POWs in Southeast Asia. In 1977, after the finding of presumptive death, she married Robert Davis. "And then I started having my own children," she said, "so I had to give up teaching. These days, all I teach is religion classes," at St. Gerald Majella Roman Catholic Church in Kirkwood. She has two sons - Nathan Davis, 21, and Dustin Davis, 20. Her husband and sons will accompany her to Washington for the burial of her first husband. Also on hand from across the country will be his family - including his sister, Gail Innes of Chicago, who has kept in touch with Davis across the years. "Until a couple of days ago, his sister and I would have called the news a celebration," Davis said. "That's because we knew at last that he had been killed in the plane and hadn't been captured and suffered as a prisoner of war.